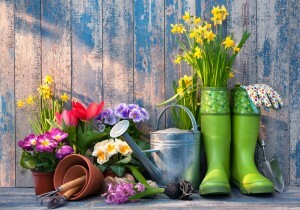 Spring is the perfect time to turn over a new leaf in many aspects of your life, including your garden. You can start a vegetable garden, spruce up areas you may have neglected, renovate your lawns and plant new blooms to inspire as we head into the warmer months. In this article, we’re going to give you some tips on how to update your home exterior for the better. With a greater emphasis on sustainability in our community, there’s never been a better time to add in a vegetable garden to make your home a little more self sufficient today. Early spring time is the best time to plant new vegetables, whether you’re planting a whole new garden, or simply growing herbs in the sunny corner of your kitchen. The best vegetables to plant are the summer seasonal varieties, such as tomato, chilli, lettuce, parsley and basil. As we start to see less of winter, the trees are starting to regrow their leaves, which means you can plant flowers too. Flowering bulbs such as daffodils or tulips, or potted plants such as pansy, polyanthus or cineraria, add a stream of brilliant colour across your garden. Make sure to also plan ahead for the summer months, by planting seedlings of petunia and phlox in your garden beds or pots for continuous colour. Spring, and eventually summer, means we’ll all be spending more time in the beautiful outdoors. One of the best ways to update your home exterior is to clean or mend your existing outdoor furniture so your loved ones have plenty of seating for those Sunday barbecues and backyard cricket. Add new life by repainting faded furniture, adjusting and tightening the nuts and bolts, and cleaning pathways and stone areas to remove accumulated dirt or leaves. A Better Driveway specialise in decorative concrete landscaping solutions, such as exposed aggregate concrete driveways and coloured concrete pathways. For more information, get in touch by calling 03 5783 4746.